I feel like it's time to mention these legendary dudes - Kyuss. The whole idea of desert rock is attributed to them, and they have served as inspiration for tons of bands nowadays. Much like Black Sabbath in that sense. 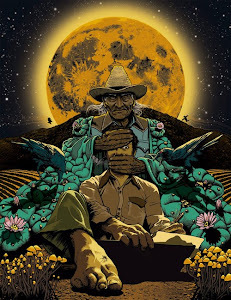 Very catchy tunes, raw sound and stunning desert grooves. The word 'raw' actually describes their sound really good. And John Garcia's vocals are still in the top 3 best vocals I've ever heard. Bottom line is - this band is one of those bands that formed my interest in the scene. Kyuss formed in Palm Desert, CA in the late 80's and have been active until 1995, releasing 4 albums that defined the sound of proper desert stoner rock. Guys behind Kyuss originally were John Garcia, Josh Homme, Brant Bjork and Chris Cockrell. Then the band changed the line-up a couple o' times, joining forces with guys like Nick Oliveri, Scott Reeder and Alfredo Hernandez. 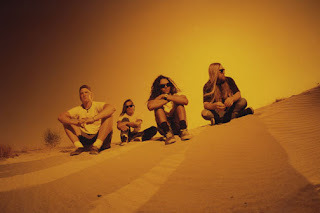 After Kyuss split, the members had participated in numerous other noteworthy projects like The Desert Sessions, Slo Burn, Unida, Hermano, Brant Brjork and the Bros, Queens of the Stone Age. Everyone digging the sorts of music this blog is about should give them a good listen.